Today is Wedneday, November 2, 2016. Six days remain until the United States Presidential Election, and there are 59 days remaining in this year. On this day in 1920, KDKA Radio here in Pittsburgh started broadcasting as the first commercial radio station in the United States. At the time, it was using the temporary call sign 8ZZ. Its first broadcast was of the presidential election results. Currently owned and operated by CBS Radio East, Inc., KDKA is a Class A, or clear-channel station, with a 50,000 watt, non-directional signal. There are about a dozen other stations in the United States that broadcast on KDKA's frequency of 1020 kHz, but they're mostly daylight-only stations, the closest being WIBG in Ocean City, New Jersey. KDKA'a Class A status gives it protection in a 750 mile radius around the transmitter; any stations broadcasting on 1020 kHz within that radius must sign off at sundown. 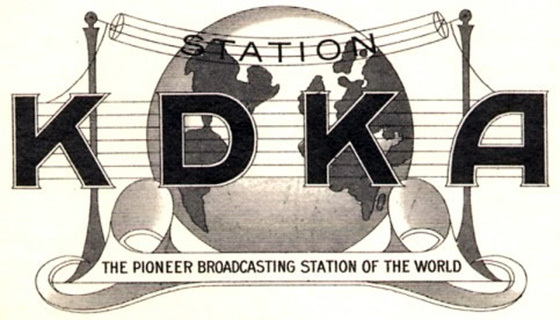 Until the advent of FM radio in the late 1970s and early 1980s, KDKA-AM dominated the Pittsburgh radio market; the joke was the station could broadcast a 1 kHz tone and still place first in the ratings. As a child growing up in the 1960s, I can vividly remember walking home from a friend's house while listening to Bob Prince do the play-by-play of a Pirates game. I didn't have a portable radio with me; I could hear the came through the open windows and the radios on neighborhood porches. Frankly, I don't believe my parents or grandparents were aware there were other radio stations on the air... every set was tuned 1020 AM. KDKA originally played music during the day, featured a 60 or 90 minute news segment during evening drive time, then transitioned to talk during the evening and overnight. As the decades passed, KDKA became more and more talk oriented until April 10, 1992- the day the music died on KDKA. The last song aired as a part of regular programming was Don McLean's "American Pie". KDKA picked up Rush Limbaugh around then and, frankly, that's when they lost me as a listener. The big switch from AM to FM broadcasting in the late 70s and early 80s decimated the ratings of most of the AM stations in the Pittsburgh market. KDKA-AM remains the top AM station, but it ranks an overall eighth place in the top ten AM and FM broadcasters in the latest Nielsen ratings. KDKA has less than half the audience of the market's number one station, WDVE, which features an album-oriented rock format. Among other things, today is National Deviled Eggs Day. Recipes for deviled eggs- or stuffed eggs, as they were then called- can be found in old Roman cookbooks dating back to the late fourth century. The term 'deviled' as applied to food first appeared in print in the mid-1750s. There are actually two definitions for deviled: food grilled or fried after being coated with condiments or breadcrumbs, or food that has been highly spiced. If you don't care for spicy foods, take heart; today is also Cookie Monster Day. And if you're a real killjoy, it also happens to be National Eating Healty Day. Speaking of eating, it's the time of the year that McRib sandwiches start appearing at McDonalds. "The death penalty is like the McRib. When you can't have it, it's so tantalizing. But as soon as they bring it back, you think, 'This is ethically wrong.'" The McRib is celebrating its 35th anniversary this year, and its creation can be credited to another McDonalds menu item that is also decried by some: Chicken McNuggets. Introduced in 1979, McNuggets were so popular that the company couldn't get enough chicken to meet the demand. In 1981, the McRib was introduced to give franchisees a new product to perhaps divert attention away from the chicken situation. The McRib was originally a flop. Poor sales caused McDonalds to yank the McRib from its menu in 1985. It reappeared briefly in certain regional markets in 1989, 1990, 1991, 1992 and 1993. Thanks to the success of the 1994 "Flintstones" movie, the sandwich was broght back as part of a national promotion, but disappeared again in 2005. Since then, it has resurfaced as a "LTO" (limited time offer) item in assorted markets, usually in the fall. McDonalds likens the McRib's sporadic availablity to that of the Shamrock Shake, which is only sold in the spring, around St. Patrick's Day. In 2011, The Awl published an article about the sandwich, and suggested that McDonalds only offers the McRib when the price of bulk pork is particularly low. McDonalds typically doesn't announce in advance when or where the McRib will resurface, so McRib afficianados have gone to great lengths to announce when one is "spotted in the wild," or the likelihood of its availability. McRib Locator, a fan site, is probably the best place to go for information. In the past week or so, McRibs have been spotted in Missouri and West Virginia. Eastern Pennsylvania will start selling them next Monday, perhaps as a way to ease the pain of the election. The news is not all good. An owner of a number of restaurants in New York and Connecticut said it wouldn't be available in that region this year, which means there's no national release for 2016. It's going to be a market-by-market exercise. If you want the sandwich in your area, be sure to call your local franchise owner. The number is usually on a sticker somewhere in the store or on one of the windows of the drive-thru. Or move to Germany, the only place where they're on the menu all year. A Florida man was arrested on Sunday after police said he was receiving medical treatment following a domestic battery incident and tossed his glass eye at the emergency room doctor and nurse while officers were taking him away. As of this writing, The KGB Quotations Database contains 40,968 entries. Check it out. Daniel Boone, American pioneer, explorer, woodsman, and frontiersman; Lois McMaster Bujold, an American speculative fiction writer; Warren G. Harding, 29th President of the United States; Burt Lancaster, American film actor; and James K. Polk, 11th President of the United States. Today's quote of the day is from Lois McMaster Bujold: "With all this manure around, there's got to be a pony someplace." Night of the Living Dead, the first= and best- zombie movie has been restored and will shown this Saturday, November 5 at the Museum of Modern Art in New York. Filmed near Pittsburgh in 1968, the movie fell out of copyright, and the versions which have been shown over the years are bootlegs with assorted quality problems. This definitive version has been struck from the original negatives under the supervision of its director, George Romero, who engages is some light-footed semantics about the definition of "zombie." Throw another log on the generation war campfire- tightening coffee supplies are being exacerbated by the fact millennials- those 19 through 34- drink about 44% of the coffee sold in the United States. I didn't start drinking coffee until I was about 19 or 20, when I started working at a newspaper. Studies show that kids born after 1995 start to drink coffee at age 14.7. The full Bloomberg story is here. I've never liked the thought of surgery. This doesn't help: A Japanese woman passed gas during laser surgery. She was badly burned..
One of the reasons I didn't back Hillary Clinton immediately was because I was afraid her election would push the GOP over the edge, and set off a case of Hillary Derangement Syndrome that would last the length of her term. A poll out yesterday said that 82% of Republicans agree with Trump's assertion the Clinton email business is a bigger scandal than Watergate. Eighty. Two. Percent. Delusion is not a pretty thing. Over at FiveThirtyEight, Hillary Clinton's numbers are off by about six percent since the beginning of the week, but her odds are still good. She has a 71.2% chance, Trump a 28.8% chance.